It's not uncommon to kick off the new year with a renewed commitment to health and wellness—some people get new gym memberships, take up a new exercise routine or even try a new practice, like meditation. But this year, seven Austin women resolved to make commitments to health and wellness on a larger, community-wide scale. Sharla Pierre, Terry Pierre, Naomi Onyebuchi, Alexandra Wilson, Tonya Brown, Maria Brown, and Ashton Lynne Haywood are the founding organizers behind Urban Health Expo, the first event of its kind in Austin created to address health and wellness disparities faced by the black community. Created in partnership with Austin Public Health, the City's Health and Human Services department, the Urban Health Expo was conceived by its organizers as a way bridge the health and wellness gap for black Austinites by educating them on issues ranging from blood pressure to mental health to the need for exercise and clean eating. The Expo also gave attendees access to resources that will help them continue a journey toward health in the year ahead. After a year of planning, more than 400 Austinites showed up in early January to the sold-out event to workout, learn quick and healthy meal ideas and to hear from a wide range of panelists on a diverse array of health-related topics. Below, members of the all-female organizing team talk health disparities, the black Austin health and fitness community and their biggest takeaways from the first Expo. What kind of health and wellness disparities affect the black community in Austin that Urban Health Expo hoped to address? Ashton Lynne Haywood: There are multiple levels to being healthy and we wanted to showcase as many aspects as possible. To truly be in charge of your health, you have to eat healthy, workout your body, workout your mind, etc. This event touched on all of these so now the community is more aware of everything health and fitness encompasses. Are there any health disparities that primarily affect black women; or wellness disparities that are specific to the Austin community? Sharla Pierre: In my opinion, there are a few health and wellness disparities that affect black women and the Austin community in general. Breast cancer, blood pressure, and mental instabilities seem to be the most common. Tonya Brown: Lack of resources in general to the urban Austin community, but also the lack of unity and collaboration in the Austin community overall. Black women are more affected by various types of cancer, lupus, diabetes and other health-related issues than any other woman of a different race. Hundreds of people attended Austin's first Urban Health Expo — do you consider that success? What do you measure the event's success by? Alexandra Wilson: We had over 400 attendees and feel it was a major stepping stone for our community! We definitely feel it was a success, not because of the attendance, but because of the engagement and feedback we received from participants. It gave them an opportunity to discuss the importance of mental health, to get tips on how to cook quick and healthy meals and to experience a variety of fitness activities they haven't tried before by people that look like them. Sharla Pierre: We had a huge attendance and the event was very successful. The weather was 19 degrees that morning but our guests still showed up for the workout party! I determine the measure of success of any event by our guests' interest level and if they're enjoying themselves. This event was successful in so many ways. The event was informative and each session was interactive with so many interested people! Ashton Lynne Haywood: This event was definitely a success because we exceeded our expectations by a long shot. For anyone that does events, you know that you can do all the ground work for the event, and you hope that things will turn out the way you want, but that's not guaranteed. The Urban Health Expo turned out to be something that the community needed and wanted. I'm still on a high from the event's success and am so happy that I was able to begin 2017 helping others become more healthy. The entire organizing team is made up of women. How do you think that affected the organizing/community building of the event? Ashton Lynne Haywood: It's no secret that women are amazing creatures. Working with the other ladies on this event was so inspiring. We proved that women can get together, respect each other, and support each other to create something bigger than ourselves. I'm very proud of what we accomplished and hope that our work can inspire other women to work together for a common good. Tonya Brown: I personally think it empowered women. However, I do feel the setback was that we didn't connect to the male population. I feel that moving forward we should include a few men on the team or as organizers. Alexandra Wilson: By coming together to share our expertise, we showed that we are LIMITlESS! Women are beyond powerful when we work together to create one common goal — empowering the community to live a healthy lifestyle. Terry Pierre: The entire organizing team was made up of 7 brilliant women, and we are proud about that. Women are so powerful, and truly run the world. This event showed how strong women are when we work toward one goal together. We showed love, patience, compassion and attention to detail like only a woman could do. I can't discount our male support though. We did have Mr. Shannon Jones III, Director of Austin Public Health, that had a heavy influence in everything that we did. We also got suggestions and feedback in the planning process by many male demonstrators and contributors such as Jamarr Brown, Planned Parenthood advocate; Coach Jeff 'Mad Dog' Madden, UT Austin & CSSCA Director. We really appreciate their advise, and could not have pulled this thing together without them. Sharla Pierre: Women rule the world! We joined forces because each of us carried individual strengths and we were willing to share our talents to produce a much needed event that highlights health and wellness. Who were some of your favorite panelists at the event? Alexandra Wilson: We had so many amazing panelists that shined a light on mental health and ways to practice self-care. The Grand Finale Lunch & Learn had many key points from four-time Olympic Gold Track Medalist Sanya Richards-Ross, CEO of Lone Star Circle of Care Rhonda Mundhenk, Strength and Conditioning Professional Jeff "Madd Dog" Madden, owner of Pure Barre Austin Rashanna Moss, and founder of Rockstar Fitness of Ade Hazley. Sharla Pierre: That is tough because we had so many delightful demonstrators! But my favorite panelists were Rhonda Mundek (CEO of Lone Star Circle of Care), Dr. Queeneth Jones, Sanya Richards-Ross and keynote speaker Ora Houston. Is there anything you took away about health and wellness from the panels? Sharla Pierre: The topic of balance was a major takeaway for me. It is so easy to create stress and anxiety in your life and it will affect you mentally and emotionally. Balance is necessary in all areas of your life. Tonya Brown: I took away from the Lunch and Learn panel that no matter your background or where you come from, you can achieve any of your goals and dreams if you truly envision them and put them into place. No matter where you are in your journey, you have the power to create a healthy lifestyle. Everything starts within our minds and the more we understand that our challenges are just as much as our gifts, we'll be prepared to embrace those transitions and to take advantage of the power we hold. Ashton Lynne Haywood: One of my biggest takeaways was that we really need to take our health more seriously. Not just in what we eat, but also physically and mentally. If you want to be able to perform at your highest level and still live a happy life, you have to make deliberate choices everyday. Most of the panelists seem to be a part of the Austin community. Why was it important to include members of the Austin community in the event and how much did this event also create more of a black fitness community for Austin? Sharla Pierre: I truly believe that it is important to have ambassadors and representatives of the fitness community to be a part of the event to share their logic and experience to the general community. People showed so much interest in our demonstrators due to their levels of expertise in different components to health and wellness. We definitely increased our community's awareness about all needs pertaining to health overall. Tonya Brown: What better way to connect the Austin community together than having a team of panelist and demonstrators from the area. By doing this, we basically are letting Austinites know that there are people here in this community that are accessible. Ashton Lynne Haywood: It was important to include members of the Austin community because they are resources that attendees can follow up with in person. When someone decides to live a happier life, it's important that they are able to access resources in person. That human interaction can go a long way in keeping someone motivated to continue their journey to become more healthy. More than anything this event showed attendees that health and fitness is accessible to everyone, not just people of particular race. There are black people in Austin that are doing remarkable things in health and fitness. I hope that attendees learned that although being health takes discipline, it can be fun and rewarding. I also hope that people learned about resources that are available to them and feel more comfortable about utilizing them. There is a black fitness community in Austin, but it's not very big. 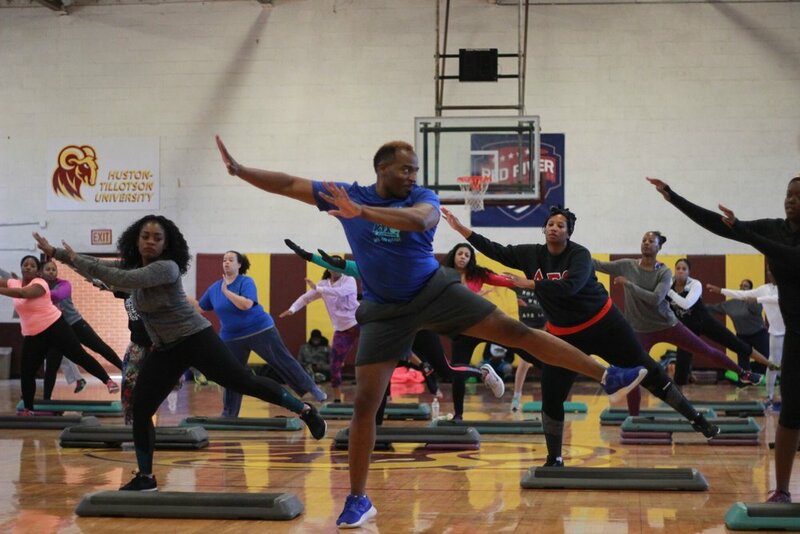 I hope this event generated more interest about health and that it will lead to a greater number of blacks participating in fitness activities in Austin. Health is so important and people need to know health and fitness is for everyone. They don't have to be scared to participate because they don't look like everyone else in the room. There are resources here for them, but they have to step up and use them. Alexandra Wilson: It was very important for us to include members of the Austin community for this event because we wanted to be sure to provide local resources for them to utilize. We have so many talented African-American chefs, doctors, trainers, educators and athletes that live here and we want to showcase their talents and give them an opportunity to educate the community on a variety of ways we can support each other and be the change we want to see. The whole wellness industry as a whole, and especially Austin's wellness industry, can be really white. Do you think this event challenged that perception and was that its intent at all? Ashton Lynne Haywood: I definitely think that this event challenged the perception of what fitness and health looks like in Austin. By showcasing black businesses and individuals who are making strides in the health and wellness community, attendees were able to see that everyone can live a healthy life. Alexandra Wilson: This event definitely challenged that perspective! That was a another reason we wanted to incorporate activities such as yoga, zumba and barre, for instance, because media does usually showcase that only a certain race or ethnicity practices those activities, but that's not necessarily true. We wanted to provide a safe space for us, where we can relate and empower one another..
Sharla Pierre: I believe it challenged that perception, but Austin is generally a very healthy city. The event was primarily a showcase of those whom need help accessing any health program, weather it be a Zumba class or information on where to check on your mental health. The intent of the event was to give our community the incentive to challenge their personal need to take responsibility of their own health decisions. We also wanted to create conversation about disparities in the black community.